3. In a medium bowl (at least 1 1/2 cups or larger) combine the cold buttermilk and the melted and slightly cooled butter. Stir until buttermilk forms clumps. 4. Add buttermilk mixture to dry ingredients and stir with rubber spatula until just incorporated and batter pulls away from side of the bowl. 5. Using a bit of flour on your hands, divide the biscuit dough in half. 6. With first half of biscuit dough, roll out to about 1/2 inch thick. Carefully place biscuits into an ungreased 9×13 pan. 7. Spoon the meat mixture on top of the biscuits and spread to level the meat. 8. Roll out the remaining biscuit dough and cut more biscuits. Place on top of the meat. Sprinkle with the reserved Jack cheese. 9. 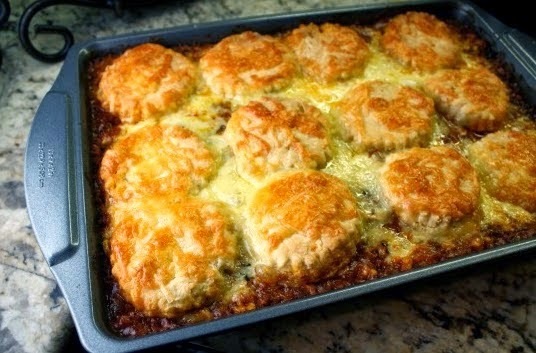 Place casserole in oven and bake for about 30-35 minutes, until the tops of the biscuits are golden brown. Remove and allow to sit for about 5 minutes. Serve.